Click these thumbnails for enlarged views of the Inversion of Light proposal. 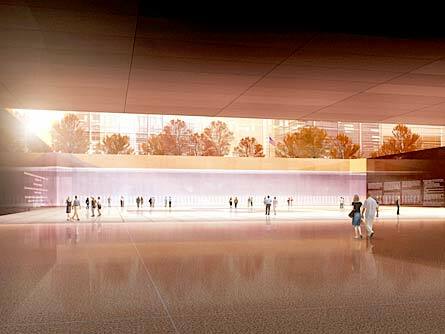 This design creates two sunken spaces on the sites of the towers, each lit from beneath. These are surrounded by a street level park. On the site of the North Tower is a model of the floor plan of the building, with a glass curtain on the spot where the first plane hit the building on September 11. On this curtain, victims’ names are etched, with separate groups of names for the victims of the 1993 and 2001 attacks. Rescue workers will be listed together. On the site of the South Tower is a pool, which at night will be illuminated from below. Toshio Sasaki moved to New York from Kyoto, Japan to attend the Brooklyn Museum Art School. He now lives and works in Brooklyn. "As a human being and a witness to the great tragedies of September 11, 2001, and the 1993 terrorist bombings, I seek a way to remember and honor the thousands of innocent lives that were lost and the courage of the heroes. I seek to address this project as a challenge to inspire the human mind and to reaffirm respect for life, to strengthen our resolve to preserve freedom, and to bring about an end to hatred, ignorance, and intolerance. The proposed memorial, conceptually called Inversion of Light , is a living memorial. Dedicated to world peace, it will ensure that future generations never forget this great tragedy. We, as human beings, hope that we can serve this memory well and lead ourselves toward peacefulness, tranquility, and purity of contemplation. We, as part of the greater universe, hope to transcend the suffering of any single generation and come to an understanding of the authenticity of eternity and the vindication of truth."